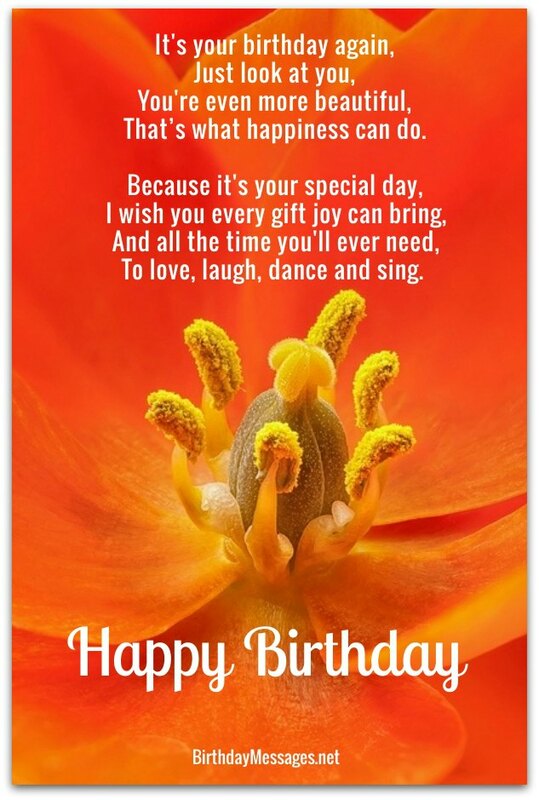 The greatest cute birthday poems, like the poems for birthdays here, have the cutest, birthday messages that can make anyone smile and feel special. Before you send your birthday wishes, be sure to determine how much cuteness is right for you (because you should really like what you're sending) and the birthday boy or girl (since you want him or her to be tickled by your message's cuteness, not nauseated by it). Need some help selecting the best cute poems? Click here right now to read my Message Guy Tip for great "how-to-choose-poem" tips. You look so trim and fit. Those years look just fine on you. I truly hope I look as good! And have fun, fun, fun, fun. That’s what happiness can do. To love, laugh, dance and sing. To be your best every day. You don't have to stop searching! Stop caring where you've been. Yay, it's your birthday at last. May your birthday never cease. And hear your glorious voice. Make your voice loud and strong!